We are offering Fluorescent Stickers to our client. With an objective to fulfill varied demands of our clients, we are engaged in manufacturing and supplying Fluorescent Sticker. - Ideal for offices, schools, etc. Leveraging over the skills of our qualified team of professionals, we are instrumental in offering wide range of Fluorescent Sticker. Bright shades of Fluorescent Stickers are made available as self-adhesive stickers, with a strong perma-tack adhesive and easily peel able release paper. 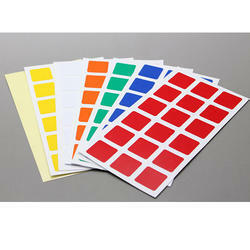 Fluorescent Stickers are used for labels, signage, and to produce various punched out shapes for craft and decorations.